Quality Traditional Painting and Taping, of Pittsfield, is sprucing up the lions at the entrance to the former Spruces Mobile Home Park in Williamstown. The lions were installed by Albert Bachand, the original owner of The Spruces in 1965. The lions were reportedly created in 1905 to commemorate Robert Fulton’s 1809 steamship trip up the Hudson and later displayed outside the State Capitol in Albany, N.Y. Bachand was said to have purchased the pair at an auction. In 1970, sculptor Arnold Prince was commissioned to recreate the lions from cement. Each lion stands 15 feet tall and weighs one ton. About 800 native shrubs and trees were planted along the drain swale at the former Spruces mobilehome park in Williamstown. Volunteers from North Branch Nursery, members of Hoorwa or the Hoosic River Watershed Association, and Williams College students planted most of the day on Thursday, September 1, 2016. 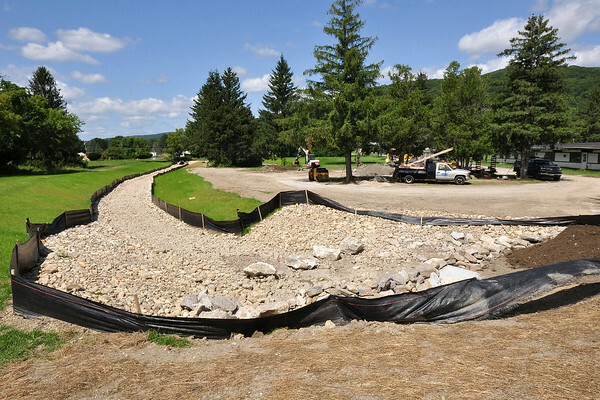 Construction on the culvert on Route 2 in Williamstown near The Spruces mobilehome park is nearing completion.